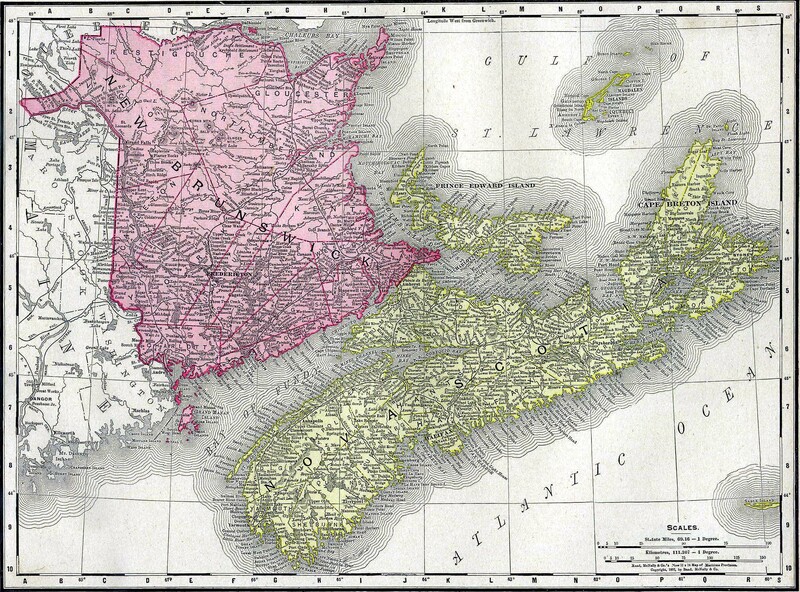 New Brunswick was originally claimed as part of the New France colony (Acadia) which also included Nova Scotia and Cape Breton Island. Small groups of French settlers established small communities along the coast trading fur and pelts with the local Indian tribes. The French claim was countered by an English claim in 1621. New Brunswick fell into the Northern part of the Americas allocated to the Plymouth Company. In 1621, King James gave them permission to settle the lands named Nova Scotia - although this term was a composite of present day Nova Scotia, New Brunswick and Maine. A small settlement was established in Nova Scotia but the weather was far harsher than the settlers were prepared for. They found it difficult to attract the right calibre settlers. Over the next century, England and France would fight for control over the Canadian waterways and lands. Slowly the English expanded their power. The Spanish War of Succession would see the French lose its grip over the area. The Treaty of Utrecht saw Britain gain control of the nearby peninsular of Nova Scotia. The French did hold on to New Brunswick and the islands of Prince Edward and Cape Breton. Although the French were aware that they were on the defensive. They built Fort Beausejour and Fort Gaspareaux along the frontier with Nova Scotia at either end of the Isthmus of Chignecto in an attempt to bolster their position. It would be the Seven Years War (1756 - 1763) that would see the British finish off French influence in Canada. There was extensive fighting throughout the Americas. Fort Beausojour was captured by Lieutenant Colonel Monckton and New Brunswick fell under British control and was amalgamated with Nova Scotia for administrative purposes. Despite their victory, British administrators were suspicious of the Acadian settlers loyalty to the crown. The Catholic French resisted all attempts to convert religion or adapt the language and customs of their new rulers. The authorities tried a variety of methods to try and assure the security of the colony from expelling the Acadians to encouraging Protestant immigration from Europe. However, the security of the colony was secured thanks to the upheavals in the 13 colonies below New Brunswick. The British government's lack of success in holding those colonies led to a huge influx of Loyalists seeking a refuge in a British Colony. Many of these settled in New Brunswick tipping the ethnic balance decisively in favour of the British. This huge increase in population meant that administrative reform was necessary. New Brunswick was specifically carved out of the huge Nova Scotia colony as a Loyalist colony. That is not to say that Loyalists did not go elsewhere, it just meant that they knew that they could be catered for more easily in New Brunswick. 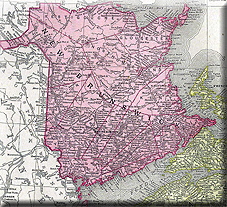 Therefore in 1784, New Brunswick was separated from Nova Scotia and Fredericton was created as the capital. 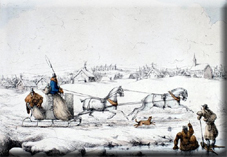 It was hoped that the inland location of Fredericton would help make it easier to defend from the Americans to the South. New Brunswick still felt vulnerable to American encroachments especially in the War of 1812 but even after their borders were fixed with the Americans in 1818 the population pressures of her Southern neighbour still made New Brunswickers nervous. Proof of their justified fears came in 1866 when Fenians from America launched an invasion of New Brunswick hoping to stir her Irish and Scottish settlers into rebellion. Many American Irishmen had recently served in the American Civil War and so were armed and experienced. Memories of the Irish potato famine were still fresh in their minds. However, the expected mass defections to their ranks never appeared and the invasion was dealt with fairly easily. However, it did spur New Brunswick's entry as a founder province of the new Federation of Canada in 1867. Defence from America was a major stimulus for the Federation.